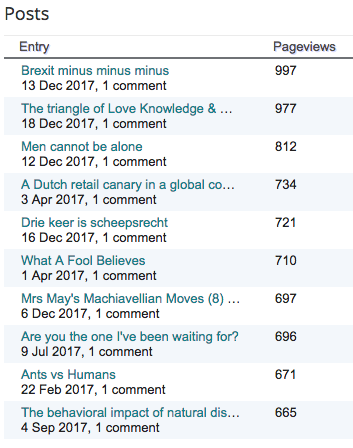 On 28 April 2014, I started writing my blog. 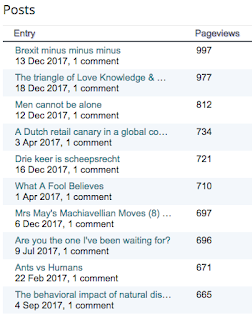 Initially my posts were only in Dutch and rather negative following my 2010-2013 divorce battle and my 2013-2014 burn-out. My number of daily views was low. This number has been increasing ever since I changed to the English language by the end of 2014. 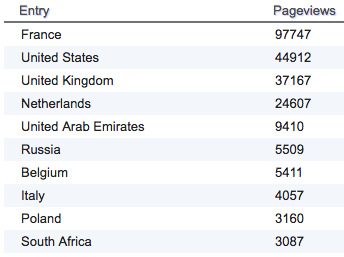 Nowadays, most of my readers are located in France - for reasons unknown. Perhaps, it relates to my choice of topics. The UK may soon overtake #3 USA. My home country, the Netherlands, is still #4. The United Arab Emirates is another mystery to me. Belgium makes sense as I lived and worked there. Italy is another - recent - mystery. The Polish readers may relate to my Russia related topics. 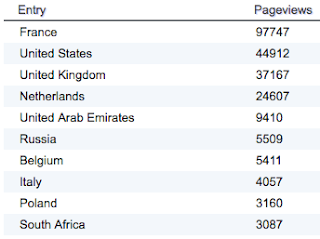 Based on the Top 10 of my most read blogs, the unique number of readers appears to be some 1,000 people worldwide. That number corresponds with some 1,000 daily views and some 25,000 to 30,000 monthly views. Seasonal highs and lows can have an enormous impact. December 2017 started low and jumped as of mid December. The response to my blog is still minimal. Usually, this doesn't affect me. Primarily, I write for myself. All blogs must however also have a benefit for (unknown) others. I wish all of you a happy and healthy 2018. 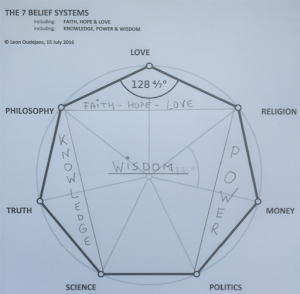 No doubt, it will be another interesting year with many changes in the 7 Belief systems (ie, Love, Money, Philosophy, Politics, Religion, Science, and the Truth), and its 3 domains (Love, Knowledge and Power).